I have been to Amici many a time and had a lot more than a pizza. But the reason I have decided to grade the restaurant solely on their pizza is because the quality and standard of their pizza I find is higher than the rest of their food and is really whats worth going for. . .The rest is not bad but doesn't stand out like their pizzas either. This particular experience was at their Saket outlet but nothing beats their cute little terrace in Khan Market... On a nice day of course! 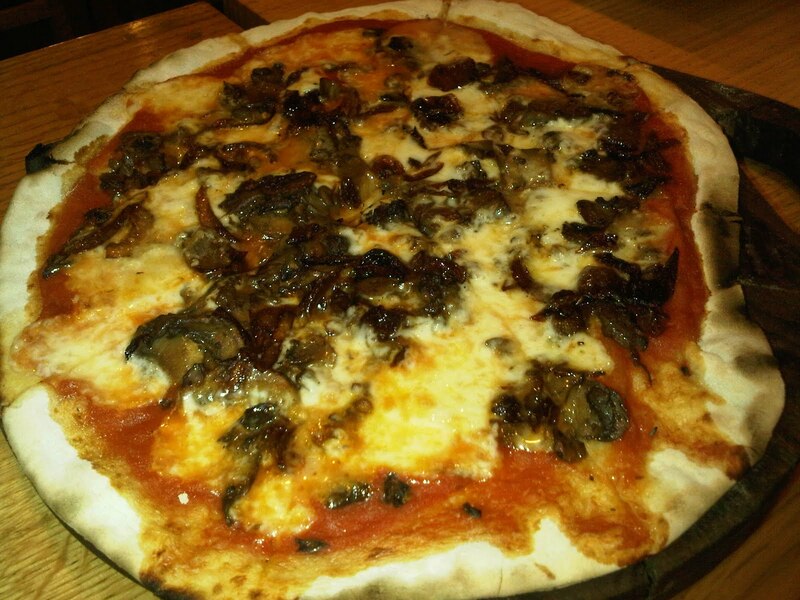 Blue Mushroom Pizza - Gorgonzola, Mushrooms, Caramelized Onions - That's a winning combination already now isn't it! Everything was delightful. The crust was perfectly thin, crispy yet soft. What on earth do i mean? Well it was crisp on the edges and the base had been "crispified" enough so the toppings didn't make it a soggy mess yet it was soft on your pearlies and not cracker like crumbling! Get it? I hope so because that's the best I can do for now! The sauce was good too, so were the toppings. They didn't stinge nor did they over do it with the gorgonzola. There is mozzarella in case you're thinking all that cheese is just the gorgonzola. That'd be a bit much now come on... So they got it all right because one element of the pizza spoilt and the whole thing really goes down the drain doesn't it? Parma Ham Pizza - Even though I didn't personally try this pizza I thought it was important to give both sides of the coin. My friend who had tried it said the parma was quite unappetizing. From its glorious pink it had gone to a rather inglorious brown and tasted a bit off too. 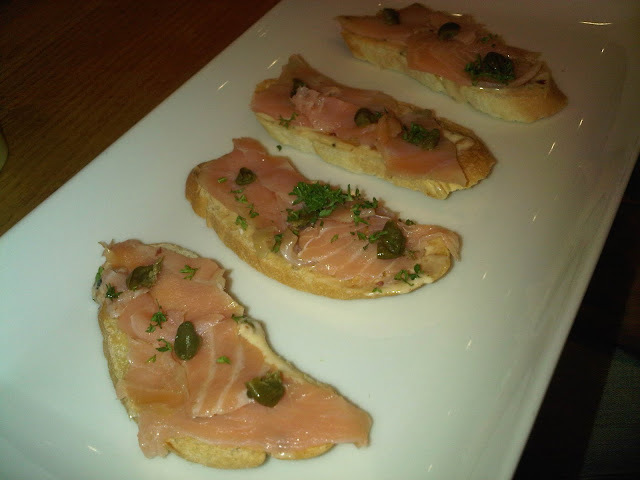 Smoked Salmon Crostini - Not bad. My brother is quite a fan of this. 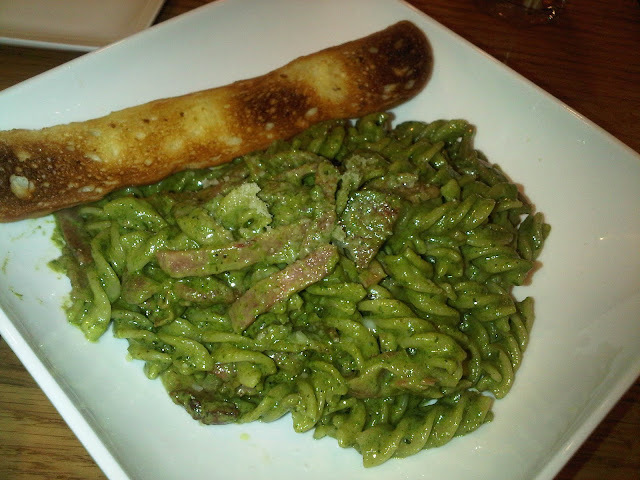 Fusilli w/ Pesto and Bacon - Oh boy was this pasta a story. So I order it and the pesto would have been quite good except it was so overwhelmingly salty and this was without even chomping on the bacon. Yikes! So I returned it fearing an early death if I ate it. When the "re-made" dish arrived, the luscious green of the pesto had turned to a more diluted pastier green. From the looks of it, it meant that they had simply added a dollop of cream to it . That's like when you complain a cocktail is too sweet and they drown it with lemon concentrate... Not helping people! Anyway I was starting to lose my patience. They took it back, I told them just don't add any salt this time... and it came... exactly the same as round one. So basically their pre-made pesto was way too salty to start with and there was really nothing more they could do but change the dish entirely. . Too late everyone's eaten and I'm full on their food and a bowl full of frustration. ! If we can get past my last rant, overall amici is a great little cafe to grab a bite or some coffee and dessert. Its one of those super convenient places to meet with a friend or colleague or even get some solo work done. And you definitely won't be made to feel like you're overstaying your welcome as you sip on the same cup of coffee for the next hour. . .